It is, in fact, a fully (sun) baked one. The Glenmorangie Company launches the Glenmorangie Bacalta in Singapore, the first time a release from its Private Edition collection is made available in the domestic market. Singapore has watched on in envy as the global market got access to Glenmorangie’s Private Edition collection even as it didn’t; the non-age statement series features the use of different cask finishes and barley types, starting with the Pedro Ximenez-finished Sonnalta PX in 2010 and ranging to the port wine finished Milsean last year. Until now – Glenmorangie Bacalta hits the market this month, and is an expression that sees its signature 12 year old further matured in Malmsey Maderia casks. Madeira is a fortified wine that goes through a maderisation process to “cook” it to produce a nutty, caramelised flavour. Malmsey Madeira, which uses the noble Malvasia grape, is the sweetest and most prized style of Madeira. Bacalta is Scots Gaelic for ‘baked’, which in the case of the Glenmorangie Bacalta is a tribute to maderisation. The process was accidentally discovered back in the golden age of sail, when sailing ships docked into ports would take aboard fortified wines for the journey. As it turned out, the stifling hot cargo ship hold would slowly cook the wine and dramatically change its character as the ship sailed from the Madeira archipelago to the warm tropics of the East Indies. The casks used in this expression are carefully seasoned to exacting specifications by Malmsey wine then and baked to maturity as the casks lay in the heat of Madeira’s sun. They are then emptied and sent to Scotland to be filled with Glenmorangie spirit that has seen 12 years in ex-bourbon casks. The whisky itself exudes aromas of ripe apricots, white chocolate and mineral notes, with complex tones of mint toffee, baked fruits, honeycomb, almonds and dates, mingling with marzipan, white pepper and melon, complete with a rich, syrupy finish. “Glenmorangie Bacalta is a burst of sunshine in a glass,” declares Brendan McCarron, Glenmorangie’s Head of Maturing Whisky Stocks (pictured). “For Private Editions, so few bottles are created in one batch and we keep it small intentionally so we can experiment and really push the flavours through. 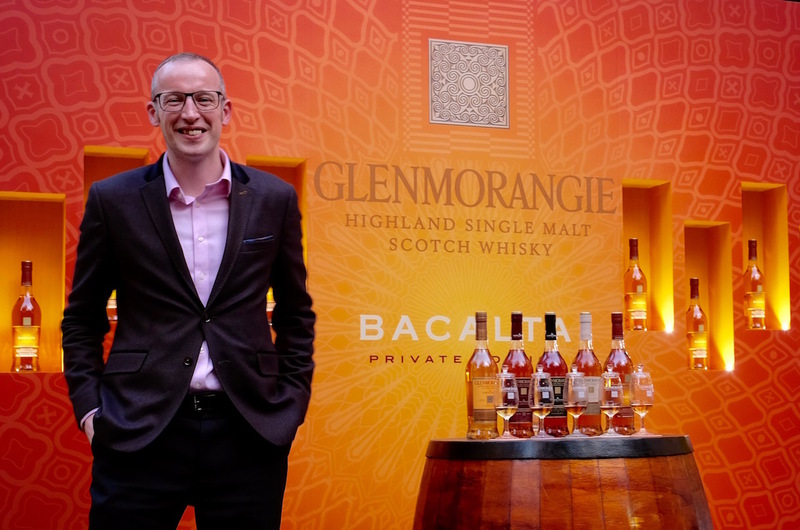 We see Singapore as an emerging market, and one that is noticeably drinking more Glenmorangie,” shares McCarron, right-hand man and heir apparent of Glenmorangie’s Director of Distilling and Whisky Creation Dr. Bill Lumsden. “By introducing the Private Edition here, we hope to give more people in Singapore a chance to savour our special creations,” he adds. The Glenmorangie Bacalta can be found in Singapore at bars including Chop Suey Café, Dempsey — PS. Cafe, Liquor Bar, The Garage at Singapore Botanic Gardens, Monti, The Summerhouse, and 1-Altitude. It is also available at retail at a recommended selling price of $$218 from The Whisky Distillery, Le Vigne, 1855 The Bottle Shop, The Standish, The Moomba, Le Rouge, Bottles & Bottles, and online store Asher BWS.